The word “connect” in Arabic is translated to “ربط – rabt” which means ‘to tie.” As we connect, we are in fact tying ourselves to one another. Islam as our rope, our connections evidently connect us to our faith. Our intentions to help one another could either be tied to our rope of faith or tied to our ego. To believe in Allah (swt) is to have faith in the highest and strongest of connections. By that connection, we are able to make smaller ties between each other. There are many born without the privileges that we have. Understanding that we are blessed no matter what is a submission in itself. Submitting to Allah (swt) through ailments is one of the highest forms of faith. While some suffer physical disabilities, their rope to faith could be stronger than others. Zakat Foundation of America (ZF) was able to meet Aliyatu, a 15 year-old girl living in Ghana, Africa. She has been crippled since the age of one, but she, along with her family, still do not know what caused it. Aliyatu has been in multiple hospitals since then trying to find the reason as well as a treatment. She has traveled as far as Duayaw Nkwanta and Burkina Faso for traditional orthopedic treatment and medication. In 2006, Aliyatu was sitting by a water well that was originally sponsored by ZF near her neighborhood masjid. A ZF representative noticed her and immediately arranged with ZF to provide her a wheelchair. Since then, Aliyatu has been receiving financial support from ZF representatives in Ghana because she does not qualify to be enrolled in the Orphan Sponsorship Program (OSP) as both her parents are alive. In October 2015, ZF’s Director of Programs, Mr, Kemal Birru, paid a visit to Ghana where he met Aliyatu and her family. After some consideration, they deemed her vulnerable situation fit for financial assistance through the OSP. She was given a wheelchair which she could peddle herself and could hold up to two animals, which her parents would be able to rear for her. She is now, also, able to receive monthly allowance to support her livelihood. 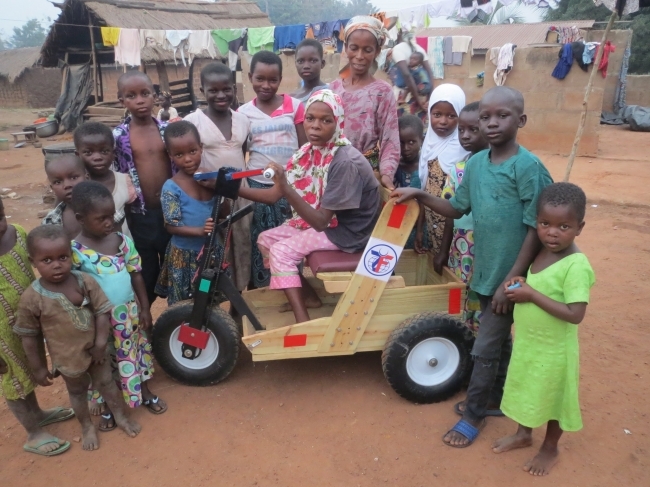 Aliyatu is able to live with the help of ZF’s generous donors. Their rope was strong enough to hold her up and keep her supported. We are all connected to each other through our faith. Islam bridges the social gap of race, ethnicity, disabilities, and gender to open our eyes to each other’s souls alone. With our rope holding firm to our faith, we may connect with one another. In an interview with her parents, they expressed their deepest gratitude to ZF for all the support offered to Aliyatu and the family since 2006 and made heartfelt prayers for all who contributed to the well being of their beautiful daughter.